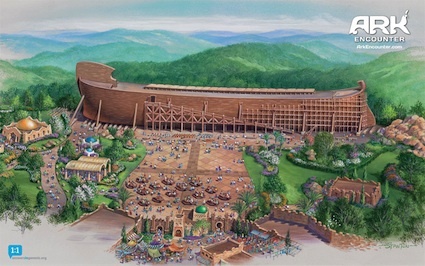 The founders of the Creation Museum in Kentucky, Answers in Genesis, are planning a life-sized replica of Noah’s ark and a theme park to go with it. Numerous questions spring immediately to mind. Fortunately, Amanda Petrusich raises many of them in her recent piece in The Atlantic , “A Boat of Biblical Proportions,” including: size, food, waste, peaceful coexistence, subsequent repopulation and speciation. Extending the list of questions is like shooting fish in a barrel. Instead, I want to point to one historical precedent for reconstructing the ark. In fact, the whole project seems rather unimaginative. Petrusich points out that arks are all the rage these days in places as varied as Hong Kong and the Netherlands. There is no shortage of earlier attempts to determine the size, shape, and details of the ark. One of the more interesting comes from the pen of the 17th-century Jesuit Athanasius Kircher. He wrote a whole treatise on the ark, the Arca Noë (1675) (the Linda Hall Library provides an online version). 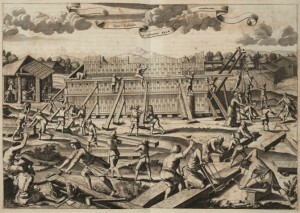 Kircher probably did not employ Amish craftsmen to build his ark (Source: Screenshot from the Linda Hall Library’s online copy). Kircher worked out all the relevant details, such as the size, arrangement of animals, their feeding and care, their selection and embarkation. 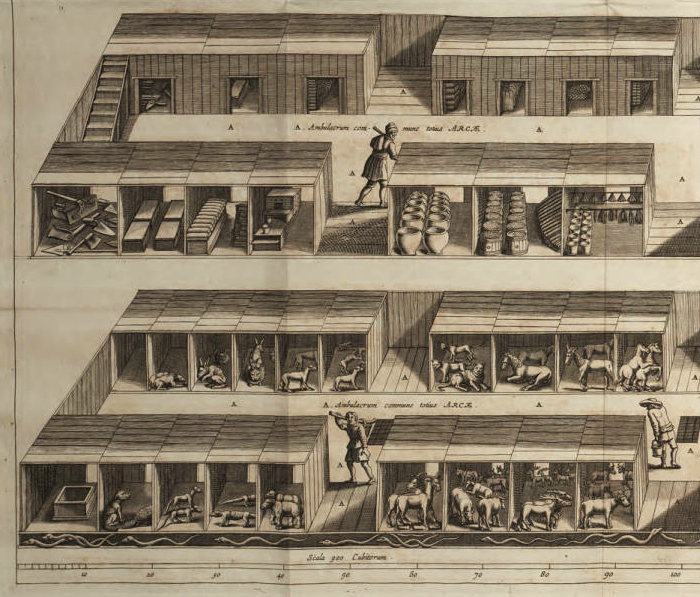 He even included handy illustrations of the layout of the storage rooms, animal enclosures, and people tending them. Although Kircher’s project was historical—he did not intend to build a full-sized replica—the backers of this new effort might be able to save some development costs if they relied on his research and design. 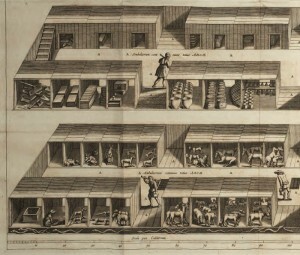 A detailed view of the inside of the ark, as envisioned by Kircher (Source: Screenshot from the Linda Hall Library’s online copy). 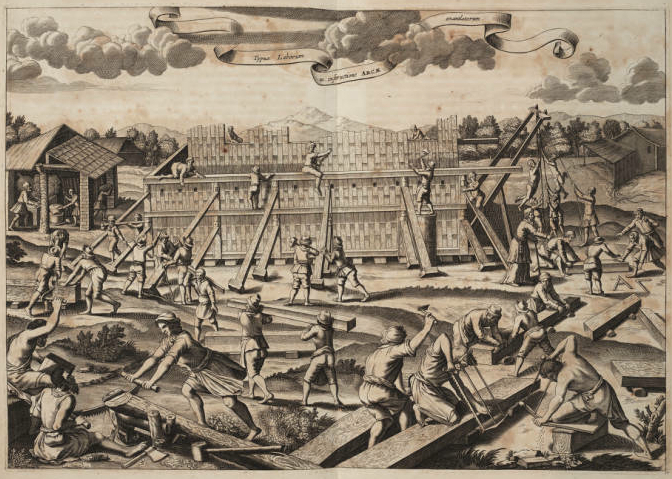 While in 1675 Kircher might have been able to claim to have science on his side, today’s ark builders find themselves at odds with commonly accepted science, despite the contributions of a geneticist with a PhD from The Ohio State University. If these valid credentials are not sufficient to make the geneticist a proper scientist, what denies her that accolade? And why would Answers in Genesis try to appropriate the label science? Here it seems like a Micheal Gordin’s new book, The Pseudoscience Wars might prove useful.